Homemade Peppermint Liqueur - Oh, The Things We'll Make! Despite the fact that we have a pretty well stocked bar in our kitchen for entertaining guests, to be honest I rarely drink alcohol. I enjoy the occasional glass of wine if we go out to dinner, but other than that, most alcohol doesn't appeal to me anymore. The holidays, though, are a bit of an exception. It all began a few years back when I found a pretty holiday book that explained how to make your own liqueurs. I was amazed by how easily I could transform vodka into whatever type of liqueur that appealed to me. The book showed how to make basic liqueurs like coffee and orange, mimicking Kahlúa and Cointreau. So, I began with coffee liqueur and experimented some more on my own from there. One of our favorites was prailine liqueur. I'm actually brewing up a batch right now, and I'll be showing you how I make it very soon! As I got older, I branched out into foodie gifts, and one year I made liqueurs. I'll tell you the story of how my prailine liqueur became a most-wanted repeat gift each year for a special someone, but today I'm going to share with you my latest experiment in making liqueurs, homemade peppermint liqueur from fresh mint leaves. 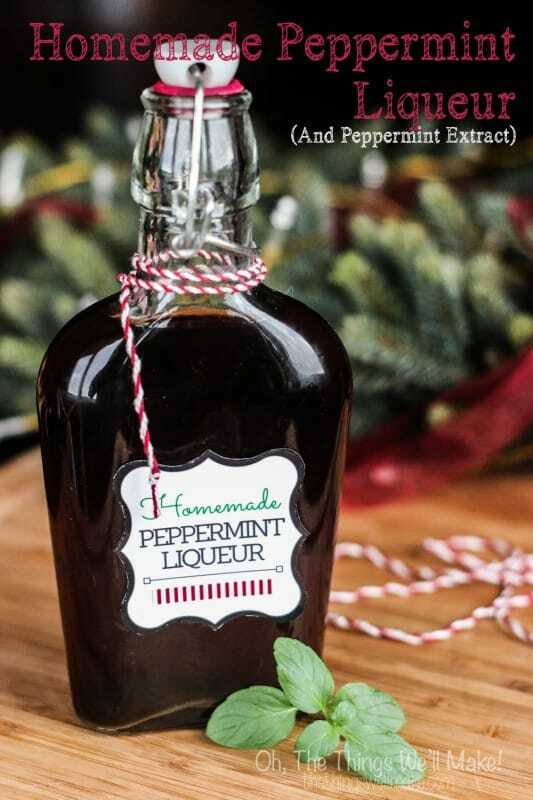 I have seen recipes online for making peppermint liqueur, but most of them use peppermint extracts or essential oils, and that feels a bit like cheating to me. I will say that by doing it that way, you end up with a nice, clear, colorless peppermint liqueur which is very quick and simple to make! So, if you're looking for a last minute DIY liqueur, then I guess that would be the best way to do it. I, on the other hand, like to do things completely from scratch when I can, so I began with a bunch of fresh mint leaves. Making homemade peppermint liqueur is actually very simple, and it's the perfect way to add a festive touch to your parties. 1 cup sugar I used unrefined demerara sugar. Rinse your mint leaves and place in a large glass jar. Cover them with vodka until completely, or almost completely, covered. Let them steep for several weeks. You can occasionally shake them, if you remember, but it isn't a necessary step. Mine were steeping for just over a month, but you really don't need that long! Strain out the leaves from your vodka. You now have a peppermint extract! Save a little bit of it in a separate bottle for recipes, if you like. To make your simple sugar syrup, dissolve 1 part sugar to 1 part water over medium heat, stirring until the sugar has completely dissolved. Remove it from the heat and let it cool. To finish making your liqueur, add a bit of the sugar syrup to your peppermint vodka (aka. peppermint extract) to taste. I used 3 parts vodka to 1 part sugar syrup, but you can make it more or less sweet to suit your taste buds. Homemade peppermint liqueur made form fresh mint leaves isn't clear or green, but more of an amber color. If you use an unrefined demerara sugar like I did, it will become an even darker brown. I ended up making up a label for my liqueur. Feel free to print it out and use it, if you like! Happy holidays to all, wherever you may be celebrating them! I’m thinking of adapting this recipe to make a peppermint gin because we had one on holiday in Menorca many years ago now (they gave free samples in the shop) and I’ve been dying to have some ever since. I know it won’t be exactly the same since that was made at that specific distillery with their rather unique gin as a base. Well that and I have no idea how to pick a decent gin to use as a base as I tend not to drink it other than when out (in cocktails) but my experiments last year with making homemade liqueurs turned out really well so worth a go! Just have to hope that the supermarket has mint leaves in. With my other infusions (fruit and one with cacao nibs) I added the sugar to the alcohol whilst it was infusing rather than adding a sugar syrup. Is there any reason why I couldn’t do that with this? Does it affect the leaves more or is it just a matter of adjusting for individual tastes at a later stage? I’m sure you could most certainly just add the sugar to the alcohol. Most recipes I’ve found/made in the past have made the sugar syrup and added that to the alcohol. I think it’s to make the alcohol milder as you sweeten it because you are lowering the alcohol percentage by adding the syrup. If you just add sugar, you’ll end up with a stronger liqueur. I don’t imagine it would otherwise have any effect on the leaves. Good luck! I’d love to hear how it goes! I’ve since changed my mind about using gin after doing a bit of research and finding that coriander (cilantro) is a VERY common ingredient in gin and since my Mum has become super allergic to coriander I decided that maybe just using a neutral vodka might be better after all since some will be a gift for her. I don’t know if she knows about it or not but it might explain why she sometimes gets ill after certain cocktails now but not others. Oops, I spelled my name wrong (and I didn’t even have the liqueur yet) What is the shelf life with and without refrigeration? I’m not really sure. I haven’t refrigerated mine, and the batch I made in the picture, made before I wrote up the post, still tastes good to me. I actually just got up and poured myself the tiniest bit in a shot glass to make sure. I’ve had that batch for over a year, so it should keep for a very long time. OK- I couldn’t see the publish date on the post from the place I answer comments, and just realized that I still had a small bottle from that batch that was made in 2014! So, it’s really over 2 years old, and still tastes nice and minty. Hi, I have so much mint and your recipe sounds delicious! Do you know the shelf life, with and without refrigeration? I’m trying to preserve my mint leaves now since they are flourishing and use them at Christmas time for gifts. 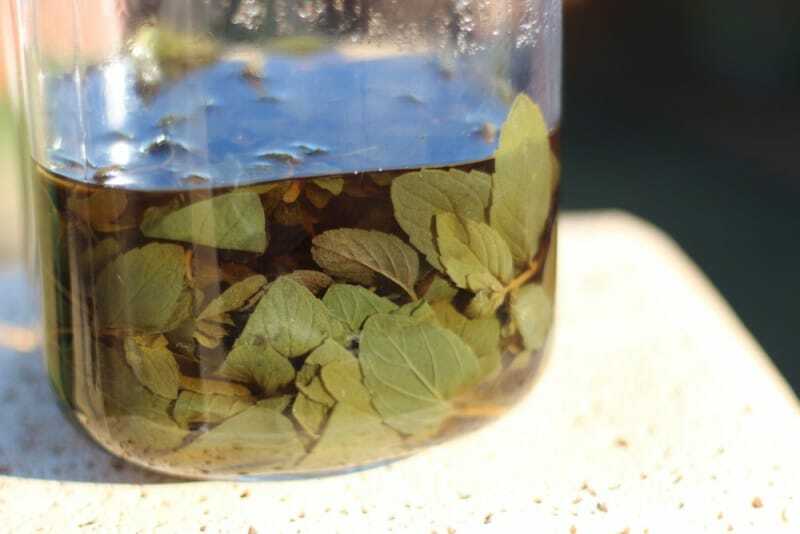 Is there a way to preserve my mint leaves now or can I go ahead and make the peppermint liqueur? It’s early in the year but I’d hate for my peppermint leaves to go to waste. There’s no reason not to go ahead and start making the liqueur now! I still have a small bottle from when I made this batch and wrote this post, and last time I tried it, it was still good. I’ll hit reply now, just in case, and if I actually get to going to check on the liqueur, I’ll come back and comment again. Ha! Thank you! I was wondering if you could make your own peppermint liqueur from leaves, but as you mentioned there aren’t any recipes to make it from scratch. Except for this one! I’ll have to get some vodka tomorrow. I’m so happy my recipe helped you. I think most people are looking to have an either colorless or green peppermint liqueur, something that you don’t really achieve with the leaves. In this case, though, I prefer to use the real deal than to have a “prettier” product. That said, I’m sure one made with essential oils tastes lovely too. Thank you for this simple and easy to make mint extract recipe. We recently built an Apothecary Garden, I used to be acook, now I wish to make liquers, wines, chutneys and jams and marmalade.the recepie for mint liquer sounds fantastik. thank you. All sound lovely. I love making homemade liqueurs. I can’t believe I never got around to showing some of the others I made. My favorite is probably praline using pecans and vanilla beans! I would love to get the recipe for your praline liqueur – is it published anywhere? No. I guess I never got around to post that, but do have pictures. Perhaps I should try to find my recipe and post it in the next week or two for you. I’ll try to remember to let you know when it’s up.